I've used every conceivable search button so don hammer me to bad please. So here's my dilemma. I have a very nice 280z with a few bad spots on the drivers side floor pan. Yes I know Zedd is the floor guy for these cars and he has been very helpful buuuuuutttttt his panels don't work with factory frame rails. I can't believe that no one has made a factory replacement floor pan for our cars that will work with the factory rails!!! Anyone know of anything in the works??? For what its worth, i took the extra step of flat out replacing my frame rails while i was doing the floors. They are stronger, safer and you can prep them from the inside out to not rust ever again. If you're willing to spend the money and do some extra labor, just replace EVERYTHING while you're there, this way 5-10 years down the road you won't have to do all that work over again. Have you thought about cutting out what you need from a donor car?. I don't understand what you mean by not working with the factory frame rails. Here's a before and after of a driver's side floor pan replacement I did on a 280Z using the parts from Zedd Findings. Yeah, its not an exact copy but it came out pretty nice. If that's the case I'd just cut/bend some new sheetmetal to replace the offending area. It's pretty rare that anyone replaces an entire floorpan without doing the rail at the same time. If one is rusty, the other usually is as well. Take a small hammer and tap the rails. You might find out they are rusted on the inside and not visable from the outside. The rusty spot is over the rail and I've cut the area out and can see the inside of the rails and they are mint. I'm going to clean them and brush/pour POR15 on the inside before I weld the new section in. I'm going to cut a small 2x2 section out of the top of the passenger side and check to make sure there are no issues on that side also then tig the cuts up and you'll never tell it was cut open. The problem with this patch is the drain plug and stamped recession as well so it would be a little tough to duplicate. 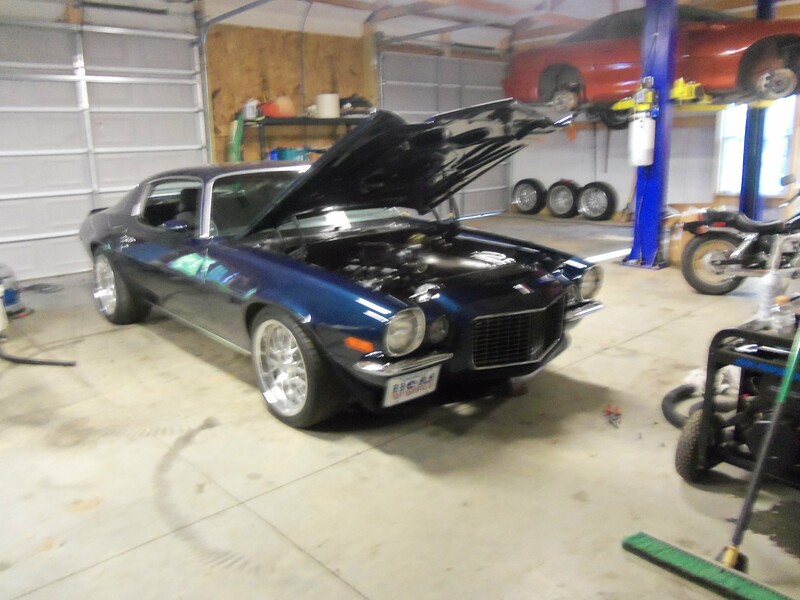 I've attached a picture of my 1971 Camaro with a supercharged LS6 TKO 5 speed Currie 9" etc, it makes 562 rwhp and I put 1/4's--roof skin--rear body panel and floors in this car due to the vinyl top. Do not use POR15 in any area you plan to weld. It contaminates the weld and burns off so its basically useless. Use Wurth or 3M Zinc Weld Through Primer. Its also a good idea to drill a couple small drain holes in the rail and spray in some kind of cavity protection spray after you're all done. I used the por 15 but only after I was done welding...because I thought of the same thing that it would burn...so I did it afterwards...por 15 is the best though..
Not sure ANY aftermarket panels just plop in place without working them . To say that the Zedd panels don't work with stock rails is not really correct. With some caressing they would probably be undetectable after installed. I have installed the Zedd floors and rails- though not perfect, they worked well and looked stock. It's how much time you want to put into it. If anything , I noticed the outboard side of the floor panel was not formed quite right and it caused the floor to be too low with respect to the frame rail . This is fixable.